My name is Kenneth and I write cool Mac and iPhone software. This is my personal weblog where I post about stuff I find interesting. I usually write about Mac development, the business of shareware and the Mac community in general. When one hears stories from iPhone developers, they’re either from the lucky ones who made insane amounts of money and laugh all the way to the bank, or rather from disappointed developers who consider their efforts a failure. The latter tend to blame the App Store for the failure of their application(s). Granted, the App Store is a harsh market which has both its advantages and its flaws. But, in my humble opinion, a good craftsman never blames his tools. The App Store has trends that can be analyzed, and if you’re going to be developing for the iPhone, you need to learn how to adapt. I have learnt this first-hand through experimentation, and have learnt many valuable lessons along the way. Last September, while working on a much bigger iPhone game, I thought it would be cool to create a quick one-trick application for viewing jokes. I never envisioned that iLaugh would become my most lucrative app that would keep me going while I develop the aforementioned game. 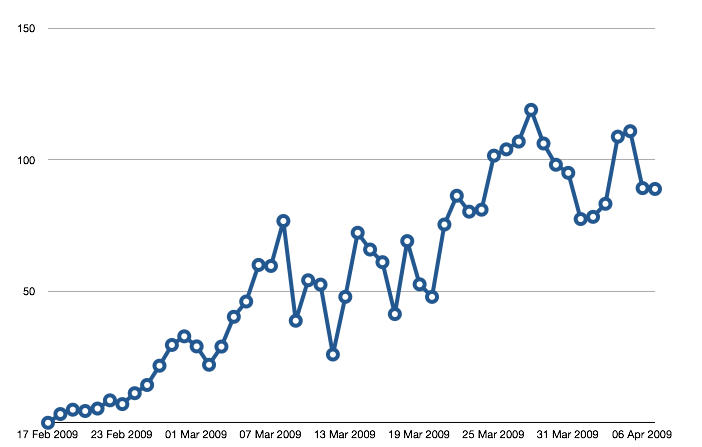 The Y-Axis shows daily revenue in US dollars. Let’s leave the end of the graph (Feb-Apr) aside for a minute, we’ll get back to it. You can see the initial release spikes, typical of the App Store, and then a very depressing downwards trend right after release. For the second release, 1.1, I upped the price from $0.99 to $1.99. Which slightly lowered the initial spike revenue. But at that stage, I had a much more mature app which unfortunately, due to lack of effective marketing stagnated at a sub-$20 daily revenue. But in February, I made pretty much the best decision I have ever made. That, of course, was to release a Lite version. I initially thought it would be a nearly cost-free way to get some free advertising for the premium version. The main reason I put ads inside the Lite version was actually not to create revenue, but rather to give users a reason to upgrade. But, other than that, the Lite version was an identical, fully functional copy of the premium version. As you can see, it did a pretty decent job of advertising the premium version. 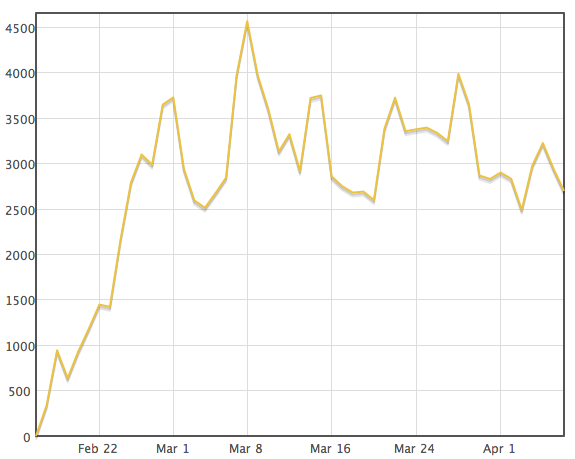 Since the mid-Feb release of iLaugh Lite, daily revenue for iLaugh has been much higher than it previously was. Fortunately, iLaugh Lite became quite popular on the iTunes App Store, and while never entering the global top 100, it has charted as high as #29 on the Entertainment chart, and has been in the top 40 entertainment apps nearly since its release. While this did have some unexpected consequences, like bringing my entire server down due to excessive traffic which brought the iLaugh service down and forced me to upgrade to a better server, the benefits were pretty clear. 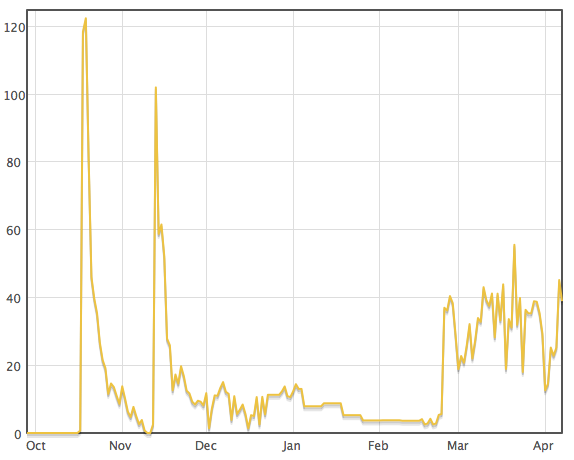 This graph shows daily iLaugh Lite downloads. This equates to about 100,000 monthly downloads. Here’s a graph that shows the web-service traffic this generates (since each joke is fetched from my server, this gives me a pretty good overview of the actual usage of the app). Unfortunately, I only started using this particular analytics package on March 2nd, so that’s when the graph starts. To date, iLaugh has served over 6 million jokes, and it’s going at about one million per week. As the installed user-base for iLaugh Lite grows, so does daily ad revenue. Currently, I’m seeing pretty good numbers. I have around 6 million monthly ad impressions, and as you can see in the above graph, I’m seeing around $100 daily ad revenue. While these aren’t mind-shattering numbers, I think they give a pretty good overview of what one can achieve as an average developer for the iPhone platform. This entry was posted on Wednesday, April 8th, 2009 at 10:28 pm	and is filed under Articles, Business, Cocoa, English, iPhone. You can follow any responses to this entry through the RSS 2.0 feed. You can leave a response, or trackback from your own site. Finally, a balanced article on iPhone development. Great point about good craftsmen not blaming their tools. The App Store is the best thing that ever happened to indie developers. Unfortunately, many developers don’t understand what non-software engineers do on their phones, and don’t understand basic economics. I am VERY interested in finding out who you are getting your ad revenue from? what would you suggest to get started? Can you email me with such info? Congrats ! If you can provide the answers for these questions it would be great. 1. Who is your ad provider ? 2. Are you doing CPC or CPM ads ? 3. What is your Click Through Rate ? Nice write-up, Kenneth. It’s always interesting when developers are transparent with their numbers. Great post - it is interesting to see the stories of people who are building up there business vs the people who are simply hitting the lottery with a popular app. The App Store is a great way to start publishing your own software as a one person or small team shop. Definitely linking back to this post so my readers can hear your story! An interesting writeup… what do you use for the ads? AdMob? Very cool article. I had no idea that such great revenue was possible for an iPhone app. I’m learning Cocoa right now, and after I’m a bit more learned and experienced, I may try my hand at iPhone development (after I get an iPhone or an iPod Touch, that is). I’m studying Cocoa programming for Mac OS X right now, but maybe after I’m more comfortable and experienced, I’ll try my hand at iPhone programming (not to mention, once I get an iPhone or iPod Touch). I never knew it could be so lucrative. However, I think this is not describing the success of an average developer doing consistent work, but it is more another one-hit wonder. There is a lot of evidence going around that a large majority of apps is only used a day or two. So to a certain extent you did enter a lucky spot (and probably not intentional) with a high daily reuse rate which is key to any ad-based revenue. So don’t get me wrong, great success and you have deserved all of it, what I am saying is that you try to differentiate yourself from those who got lucky in the appstore and to a point I think you actually did get lucky, too Nothing wrong with that though and I like the analytical approach you take. All the best, great story. A lot of you are sort of throwing around ideas as to whether or not the revenue made from this app is worth the time spent. Keep in mind that Kenneth hasn’t even entered college yet, and at the time he released the original iLaugh, he was still in high school. Maybe this isn’t as ambitious as projects pursued by Phill Ryu, but I still think it is a huge success. And regarding arti33’s comment about opening a coffee shop… opening one costs more than a few hundred dollars and requires much more work. In simple terms, that was a silly argument. How much do you think a brand new free app with ads can make per day just starting out? If you have any specific question you’d like answered, your best bet is to contact me by email at kenneth@ballenegger.com. Congrats and good luck with iLaughs. Great concept imo. I only recently added iAds to lower priced apps. I think it was incredibly helpful as I hadn’t used a tabata mp3 before, don’t understand some people, just ignore them and keep on doing what you do best. All Content Copyright © 2005-2008 Kenneth Ballenegger. All Rights Reserved.